Going out two nights in a row = tired Jodi! Worth it though. 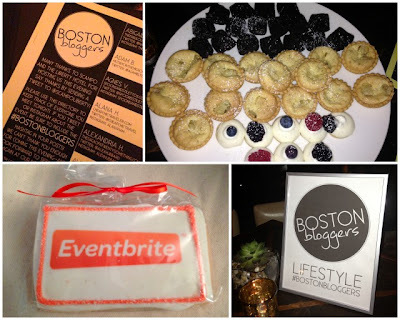 Last night I went to a Boston Bloggers event at Scampo in the Liberty Hotel. For those of you not familiar with the Liberty Hotel, it was the Charles Street Jail from 1851 to 1990. After major renovations it looks amazing! In addition to the hotel there are several restaurants/bars inside. You can read more about the history of the jail here. Anyways, in addition to the place being very cool the event was also a lot of fun. The food was delicious. The desserts were AMAZING. I could have eaten the whole plate of treats that was conveniently placed in front of me! Don't worry I shared. The service was excellent. We were a big group. The servers were so attentive to taking our drink orders and clearing away our dirty dishes. I will definitely go back here for dinner at some point. It was so nice to catch up with some of the bloggers that I have met in the past. I spent time chatting with Jen, Abby, Morgan, Georgina and Kate. I also met some new people too and I look forward to stalking checking out their blogs! As always, Allison and Kate put on an awesome event. 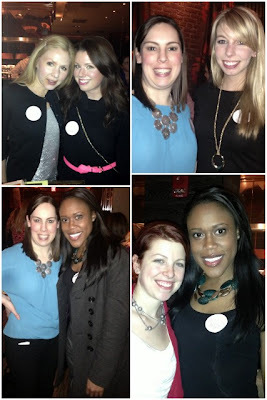 Have you ever been to a blogging event in your city? What did you think? 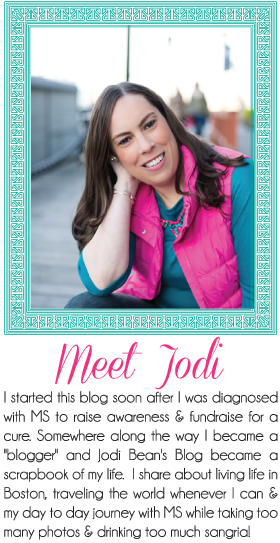 I highly recommend connecting with other bloggers if you have the chance! P.S. I forgot to set the DVR for The Bachelor but I got home in time to see the last date and the rose ceremony. I can't believe we have to wait two weeks for the finale. Oh and it is a THREE hour finale. Seriously! Good thing I love this show. Ha! What do you think of the final two ladies? Do you have a favorite. I know who he picks so I'm keeping my mouth shut. so sorry not to have met you last night especially since the layout at Scampo was perfect for our group. cheers! 3 hours of the bachelor might literally kill me. I wish I knew of an event like that here in CO. I would love to attend. It sounds like you had a great time. how fun!! I want to go to a blogger met up some time! Cool! I've never even heard of a blogger event in Philly. Looks like you had so much fun! I love blogger meetups! Looked like a fun event. Its nice to go to these blogger meet ups. I love meeting up with bloggers IRL...It's always so much fun! I wish there were blogger events like that here!! And I don't love either of these girls, but I see him with Lindsay more than Catherine. We shall see! Wow! So fun. That hotel sounds awesome! I love that kind of history! I've never been to a blogging event, but I've met a few bloggers on my own. It's so fun!